Saint Sister, formed in November 2014, is the creation of Morgan MacIntyre and Gemma Doherty. 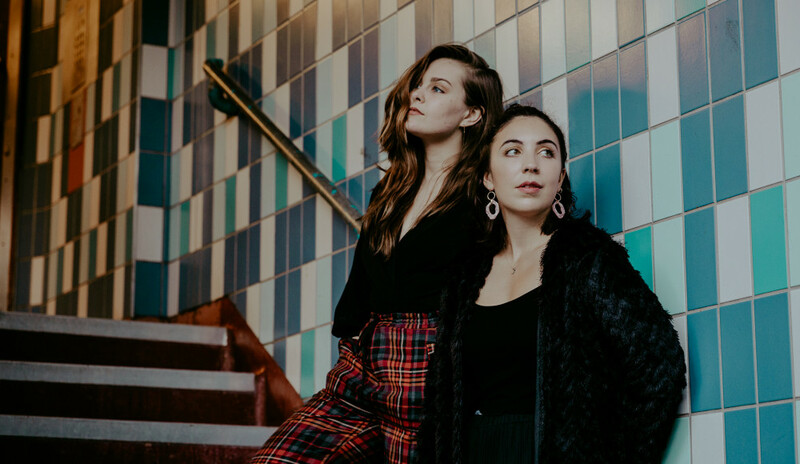 Their music draws from early Celtic harp traditions, 60s folk and electronic pop to create ‘atmosfolk'—a mix of soulful vocal harmonies, dreamy synth and electro-acoustic harp. Momentum quickly built for the band early on. A month after their formation they were asked to perform on TG4 (Irish national TV), and shortly after opened Whelan’s for Arcade Fire’s Will Butler. Their debut EP ‘Madrid’, recorded with Alex Ryan (bassist with Hozier), was released in November 2015 and within its first year reached over 1 million streams on Spotify. It received favourable support from Irish radio, leading to playlisting on RTE1. It was also championed by Huw Stephens and Phil Taggart, eventually being playlisted on BBC Radio 1 and on German national radio, 1Live. 2016’s ‘Tin Man’ came out as part of Communion’s Singles Club and received continued support from national radio, both at home and abroad. The track was nominated for song of the year by the Choice Music Prize and the band named "Best Irish Band" in 2016 by the readers of the Irish Times. They performed this single for a televised performance in St James’ Church for Other Voices. The band’s 3rd release, ‘Causing Trouble’ was released in June 2017. The single favoured well on radio and was playlisted across Germany, Belgium and The Netherlands. Since their formation, the band have toured extensively throughout Europe. They made their US debut in March 2016 with multiple showcases at SXSW, and have had notable appearances at numerous festivals including BBC Introducing at Glastonbury, Latitude, Electric Picnic, Longitude, The Great Escape, Reeperbahn Festival and Eurosonic. 2017 saw the band support Lisa Hannigan on a 20 date European tour as well as a headline show at The National Concert Hall, Dublin. In September the band opened for The National in the Cork Opera house. 2018 has seen the band travel to Sweden for a Stockholm headline as well as perform at Where’s the Music festival. They performed at The National Concert Hall, Dublin and The Barbican as part of the Imagining Ireland series. The band embarked on a tour of the USA in March with a sold out show in Brooklyn, NYC as well as shows in Rockwood Music hall and a second appearance at SXSW. An intimate April show in St John the Baptist church sold out in 12 hours and this summer the band look forward to playing the main stage at Body and Soul ahead of their debut tour of Australia in November.